Five dollars a month. That’s the price point that Tony Haile says users would be willing to pay his new venture, Scroll, to subscribe to bundled content from industry publishers, who would then get a good chunk of that revenue. Pricing was the easy part. Now comes the hard part, he says: Publisher collaboration. 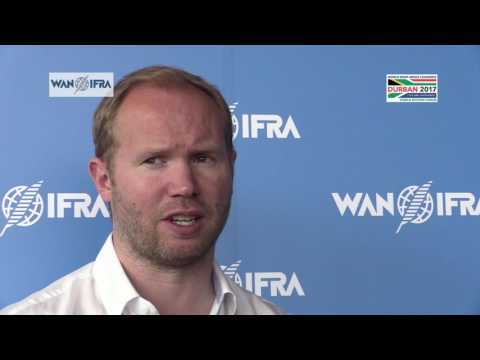 Haile, the former CEO of Chartbeat, was at WAN-IFRA's World News Media Congress in Durban speaking publicly for the first time about Scroll, his newest venture dedicated to solving the problem of how to publish sustainable quality journalism on a free and open web. The idea behind Scroll is to offer consumers an ad-free experience that bundles together engaging content from many news publishers and ultimately helps them all to monetize their content. Haile updated the audience on the company's development and potential model. Haile said he started by building a small team, including an executive from Spotify who'd been handling their business model, data and analytics. "I put him together with engineers from Google and Foursquare. I took money from News Corp, Axel Springer, and The New York Times to seed the company. And then I brought in some of the best innovators that I could from legacy and digital media to see if we could all work together to try and solve this problem." "What happens right now, if a user is traveling around the web, and they can be on Facebook, or they can be on Twitter, or they could be wherever, and they see a link to, let's say, The New York Times. They traveled from that link to The New York Times. The New York Times has a library in their CMS that can read our cookie. If there's no cookie, they monetize exactly as normal. They put ads on it. That's how they make their money. If our cookie is there, then they can live with the cleanest possible, most beautiful experience they can: no ads, no trackers, just clean fast product." "The tricky part was the economics," Haile said. "If you're trying to do a flat fee bundle, there are a few things that you have to work out. One of which is, is that if I have to make more money than the opportunity cost of revenue, which is the amount of money ads would bring in. I start looking at what's my minimum price?" Haile and his team decided to use a proxy bundle. "We took the top 80 U.S. media companies. They make about US$7 billion in digital ad revenue, from about 274 million links, which means if you put all of that money together, they're making around about $2.50 per user per month as an industry, all of them together. The New York Times makes about 14 cents a month, but others make much, much less." "If we assume a distribution pool of 70 percent, that gives us a minimum price, of about 3.56, 3.50 or so," he added. "That means if we can't get consumers to pay $3.50, we're screwed. There's no game." Haile then hired a pricing team that did a study involving a few thousand people. "What we found was super interesting. In general, if you make less than $39,000 (annually), or if you're 65 or over, then you're highly unlikely to pay for this service. But otherwise, working with other buyers is actually very reasonable, but at certain price points. The ideal price point is kind of hovering around the $5 mark. That's pretty good because if we have a $5 price point, that's gives us a $3.50 pool, which gives us a 40% lift over ad revenues. That makes a service like this viable." "But the pricing is not actually the hard part of trying to build something like this. The hard part is distribution because publishers have uneven CPMs: if I offered The New York Times and tonyhaile.com the same ARPU (average revenue per user), someone would be pissed on this side of things. Also, uneven conversion of consumers… If I just treat your standard ARPU as a number to beat, but only your most valuable ad users were to convert, I would also be in trouble then." Ultimately, Haile said his team have solved this issue by building part of the system around loyalty. "If we made 50% of the gross around engagement and time, and we made 20% around loyalty, then we could cover pretty much any scenario as we went, which was super-exciting, so we had a model that would work," he said. Haile emphasised that there is still a ways to go before launching the service. In addition to funding from both venture capital firms as well as major publishers, including The New York Times, News Corp and Axel Springer, Scroll is also getting guidance from The Washington Post, Gizmodo, The Financial Times and Mic. "We now have teams of engineers in New York and Portland who are building the infrastructure," he said. Haile said they have about 30 publishers, including some small, local publishers, working with them to test the model. Getting numerous publishers to agree on having their content bundled is what Haile sees as the most complicated part of his proposed solution. “They say in the U.S. that if you want a product to fail, you ask publishers to collaborate on it,” he said. “We can sometimes be a bit timid in this industry, despite the challenges that we face. Sometimes it can be a situation that we see our house is on fire and we say, 'I’m going to try a bucket of water,' and see how that goes. And then in six months if the bucket of water doesn’t work, then we call the fire service. … The challenges we face on the business model side, especially in the U.S., are very, very real."